When we started working with IPNav in February of 2012 the company had a legacy website and was in the process of creating a new website. 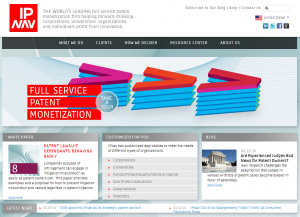 Tek-Law was hired to provide all of the content for the new website. After the site was launched we handled all of the company’s corporate communications efforts (including blogs, white papers, press releases, social media, etc.) for two years (until April, 2014), at which time the company took the function in-house. During that two-year period we took IPNav’s online presence from “one of the pack” to a very strong #2 behind industry leader Intellectual Ventures (IV), a billion-dollar+ company. We also created widely respected, first rate content. Note the company is no longer active; we have linked to archived pages. We wrote all the content for the company’s updated website, https://web.archive.org/web/20140117044727/http://www.ipnav.com/. We wrote all the content for and managed the design and creation of a new website for an affiliated company, IPCM Advisors. We wrote more than 150 blog posts and seven in-depth papers. IPNav’s blogwas followed by industry leaders and on Capitol Hill. Our Op-ed pieces were accepted by leading online publications. We prepared and submitted “Comments on Patent Assertion Entities” to the Department of Justice/Federal Trade Commission. We prepared PowerPoint presentations and papers for conferences, including ones for Continuing Legal Education (CLE) credit. We managed IPNav’s public relations, social media advertising, digital advertising, print advertising, and search engine optimization programs. The work we did with IPNav shows that with the right strategy and investment a smaller company can develop an online presence that rivals that of an industry giant, greatly increasing our client’s visibility and the value of the brand.